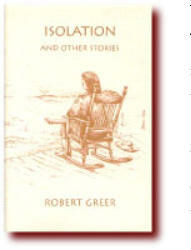 Title: Isolation and Other Stories Author: Robert Greer Imprint: PenMark Press soft cover 208 pp. USD 20.00 ISBN 978-1888570489 September, 2002 casebound 208 pp. USD 29.95 ISBN 978-1888570472 (order directly from the publisher) The twelve short stories in this collection are a marked departure for Robert Greer, who until their publication was known as a best-selling author of a series of mystery novels featuring a black bail bondsman in Denver. These stories reflect a more personal side of the author, drawing on his experiences and interests. They are set in big cities, in small towns, and mountains and plains. The characters range from homeless people to ticket scalpers, from cowboys to youthful voyeurs, from mentors and teachers to searchers and loners, of all ages and all colors, looking for identity and seeking direction. A number of original drawings add richness to the book. The book is available in both soft cover, and as a hardcover edition with dust jacket in a limited, numbered first edition . Contents Foreword The Ride Backup Spoon Prime The Can Men One-on-one Isolation Grief Red-Nickel Rhythms Choosing Sides The Real Thing Revision End notes Reviewers' comments “What we know about the world is that it’s often unreasonable and certainly flawed... What we’re lucky enough to have in such a world is a writer like Robert Greer whose fiction, head-on and headlong, straight-forwardly and particularly, portrays the complexity of our lives. The stories...are firmly grounded—by voice, by situation, by character...Greer’s fiction does not flinch; it values depiction. Greer is a realist; his stories carry within them the rhythms of life as it is lived...Always Greer’s fiction feels authentic. You trust it.” — Darrell Spencer, author of Caution, Men in Trees “Robert Greer...expands his horizon. Greer’s novels are brilliant in terms of plot and character rendering, rich in detail, and written with energy in a prose that is lively and crisp. The beauty of it all is that his [short] stories carry all these same qualities.” — Clarence Major, author of All-Night Visitors “A collection of beautifully written stories, each one more lyrical and haunting than the last. Robert Greer is truly a magician who turns mere words into characters and landscapes and cityscapes that will live in your mind long after you’ve reached the last page.” — Margaret Coel, author of The Spirit Woman “The characters in Robert Greer’s fine…collection are chipped from stone, or well-up from the earth, or, like the narrators’ rich voices, blow unhindered across America’s empty landscapes.” — G.W. Hawkes, author of A Gambler’s Rose “A short story has been compared with a flare in the sky that for a brief moment lights up one portion of the world and the lives of a few people caught in its glare. The stories in Robert Greer’s Isolation and Other Stories [do] just that. Twelve stories in all, they are set in big cities, little towns, an isolated ranch. The characters are sometimes white, sometimes black. With only one exception, the recurring theme is the power of friendship, love, forgiveness and humor.” — Sybil Downing in The Denver Post “Greer demonstrates a keen ear for the way people talk, and a gift for capturing slices of indigenous life in small-town America...[H]e succeeds in making us forget we’re reading a book...[T]he stories in this book achieve the goal of taking us into their times and places.” — Michael Salkind in the Colorado Springs Independent “[I]n settings from Texas to Chicago, from L.A. to an Irish bar in South Boston, individuals separated from the mainstream by race, poverty, or youth seek their way into it, revenge on it, or both. Most of the stories end with the same optimism — the best way to deal with a dismal present.” — Bostonia Author Robert Greer is a practicing surgical pathologist, research scientist and Professor of Pathology, Medicine, Surgery and Dentistry at the University of Colorado Health Sciences Center and the University of Colorado School of Medicine. Additionally, Dr. Greer is a best-selling novelist, a book reviewer for National Public Radio on KUVO in Denver Colorado, and raises Black Baldy cattle.